Is it math or maths? There’s a lot of people chewing on that; but who really cares? 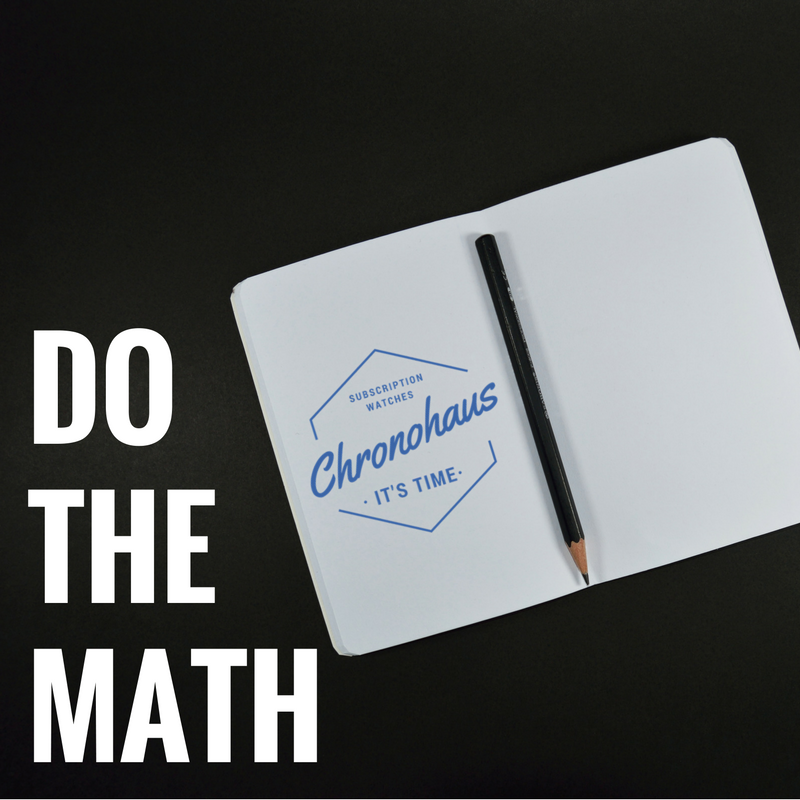 I want to explore the maths of buying watch//es – and illustrate how you can save 97% with Chronohaus (and have more fun at the same time). Watches cost a lot of money. Let’s look at a the math for a £10k watch. If you invested that £10k wisely, instead of buying a watch, you could make money. That’s the cost of tying up your capital. Let’s allow a conservative 4% pa? Watches get old! Some turn into collectibles, but that’s very rare. And even if they do, they’re still worth less than new. Let’s say 15% depreciation pa. Depending on complexities, luxury watches need a little bit of love. £100pa? And what about a new alligator strap? That’s £250, maybe. Then there’s all the other bits. If you want to sell a watch, there’s the time and hassle factor. If you want to keep them wound, you need a watch winder. But let’s keep it simple for now. So that’s £400 + £1,500 + £350 = £2,250 each year (excluding the cost of buying it). Hold it for three years, and you’ve ‘spent’ another £6,750. What if you want a little variety in your life? Heaven forbid. All of the above apply to just one watch. If you have five watches – then you multiply it all by five. So it’s £50k cash outlay; £33,750 in ‘costs’ pa, and £101,250 over three years. Hmmmmm. The irony of having five watches is that you can only ever wear one at a time (unless you’re P. Diddy). So there’s going to be four sitting in a drawer somewhere, gathering dust, and that’s less cool when they’re costing you £33,750 a year. Add to that the outlying risk/concern that the £40k of watches lying around, could get stolen, lost or damaged. Pay a simple monthly fee, and we do the rest. If you choose the monthly rotations, you get 10 wear 12 watches per year. For the Uber-luxe collection, that means about £220,000 of watches in one year. And the price you pay is only £499pm. So the total price comes to about 3% of the retail cash outlay/purchase price for those watches. Here’s our pricing.